Who needs boxed "helpers" with dried veggies, powdered seasonings and lots of preservatives? Here's an easy, tasty ground-beef based skillet dish that's all about fresh. Made with organic ingredients, it's also all about nutrition. 1. Bring a large pot of salted water to boil. Add macaroni, give it a stir, and cook until the pasta is barely tender. 2. Meanwhile, heat a large skillet over a medium-high flame. Add the ground beef, breaking it up with a spoon or metal spatula. When most of the pink color is gone from the meat, drain off some or all of the fat in the pan. Add 1 tablespoon of the butter, turn heat down to medium, and stir in the finely diced carrots, onion and garlic. Season to taste with salt and pepper. Cook, stirring often, until the vegetables are barely tender, about 10 minutes. Stir in the Worcestershire sauce and chopped fresh herbs. Let the mixture cook another few minutes to combine the flavors. 3. When the macaroni is done, drain it, return it to the pot and toss with the remaining 1 tablespoon butter. 4. 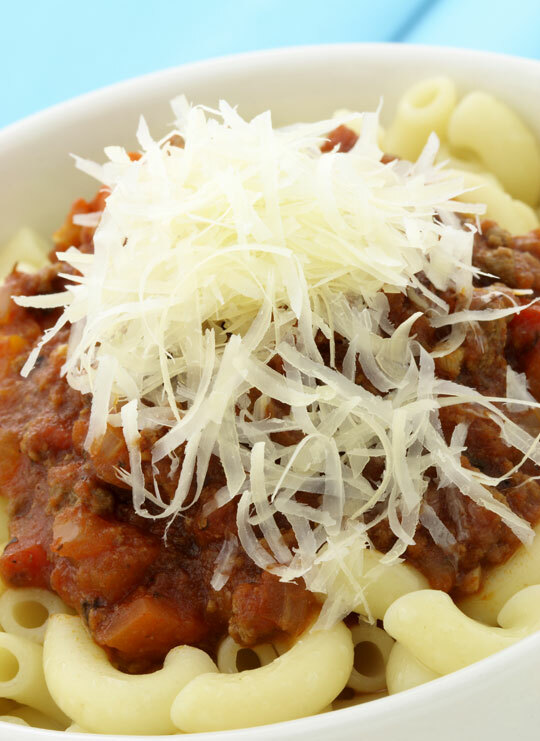 To serve, portion the pasta into shallow bowls and top with the beef mixture. Copyright by Terese Allen for Organic Prairie.